IndonesiaTravelVisit.com | Different from other temples that are nearby, Pawon Temple has vent in its chambers. 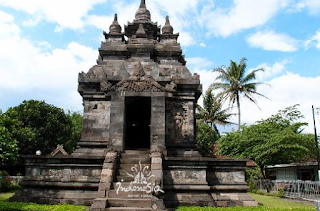 Pawon Temples becomes the midpoint linking Mendut Temple and Borobudur Temple. Pawon Temple is located right on the axis lines connecting Mendut Temple and Borobudur Temple. 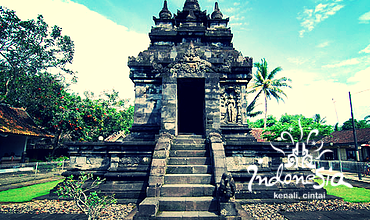 The rectangular-shaped temple with terraced roofs, and a chamber inside is sized much smaller than Mendut Temple. Pawon Temple lies quite hidden, surrounded by houses. Composed of volcanic rock with a combination of ancient Javanese Hindu and India, and the similarity of decorating style with Mendut Temple and Borobudur Temple, the experts agreed that the three temples were built in the same century. This is confirmed by Kayumwungan inscriptions or Karangtengan inscriptions dated 26th May 824 BC. When IndonesiaTravelVisit.com arrived at Pawon Temple, the atmosphere looked so calm. Javanese song was playing softly either coming from residents' houses or souvenirs stalls. Kala Makara ornament was displayed above the entrance of the temple. The pyramid-shaped roof of the temple is decorated with small stupas. As a depiction of Mount Meru, on the wall of Pawon Temple, there are reliefs of creatures such as Kinara-kinari (human-headed bird), relief of coffers, relief of Kalpataru tree or Hayati tree, and relief of Bodhisattva. All reliefs are carved on the outside wall of the temple. While inside the temple, there is no relief or statue encountered, there is just an empty cubicle. Questioning the name of the temple, the word Pawon itself has multiple meanings and interpretations. In Javanese language, the word Pawon means kitchen or a place normally used for cooking. J.G. de Casparis said that the word came from perawuan or perabuan. Whereas, local people expressed that the word came from pawuan which means landfills or waste incinerators. All these words refer to one thing that is a fire or burning process in Pawon Temple. Whether which hypothesis is true, but the chamber of the temple has 6 holes that could be a place to release the smoke from burning process. The vents are, of course, distinctive in architectural of Pawon Temple from other temples that have closed chamber. Besides being named Pawon Temple, local resident also named it with Brajanalan Temple derived from the word vajra (thunderbolt) and anala (fire). Shortly before leaving Pawon Temple, IndonesiaTravelVisit.com' mind was overwhelmed by the variety of questions. Is it possible that Pawon Temple at a period of time used as a place for cremating kings? Used as a combustion remaining equipment of a religious ritual? Used as a resting place for pilgrims before reaching Borobudur? All the thoughts occupied IndonesiaTravelVisit.com' mind and made this trip more meaningful, not just having fun. 0 Komentar untuk "PAWON TEMPLE The Midpoint of The Three Buddha Temples"